Welcome to this corner of the web. Hope you find it interesting. If you do: come back again, tell your mum or subscribe! If you want to share your thoughts on cycling in the early 21st century, then do it. Well, it's been a while but I'm now in a position to start banging on about bikes again. We've had le tour pass through the North of England, the Giro in Belfast and all sorts of other bits and bobs that I've missed blogging about. Being based in Liverpool now means I have different roads to ride on and a wholly different situation to ride in. Incase you didn't know, the Mayor of this city - chap called Jo Anderson - is currently experimenting with abandoning bus lanes. The experiment - which has lasted a year I think - comes to an end later this month. The tarffic seems to move around the city just fine but it obviously makes things more difficult for cyclists. Be interesting to see what happend from August. 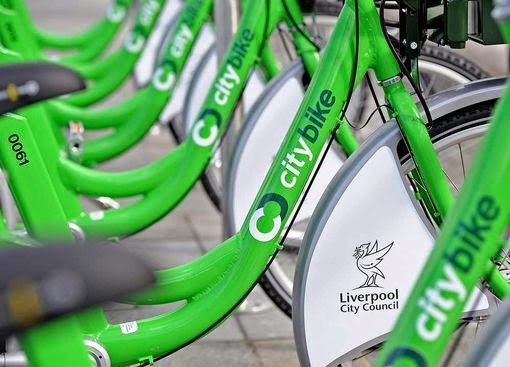 Liverpool has recently started a hire bike scheme. According to a piece in the Echo yesterday, 3000 joureneys have taken place. The bikes look good but I have only once seen anybody riding them - two lasses at the Pier Head. It’s amazing where bikes can take you isn’t it? So there I am sitting on the 07.40 boneshaker to Greenfield and being a cyclist proves to be an icebreaker with a fellow rider sharing the bike dump compartment. Hmmmm? Didn’t quite catch that but I went through a pantomime of recognition as you do. Well, that was enough for me really, I thought I have to track this guy down and find out a bit more. This blog has always been about shining lights into the dimly-lit corners of cycling culture and this was a stone I felt compelled to turn over. 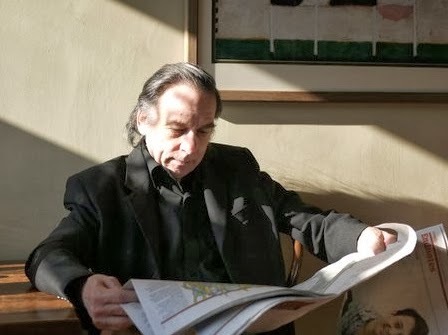 So, the starting point was… well, the t’interweb obviously and there he was, well, his twitter feed and website which I urge you to check out. I’ll drop him a line and ask him if he’ll answer a few questions for the blog. What follows is the result. Happy reading. What was the first bike you owned? 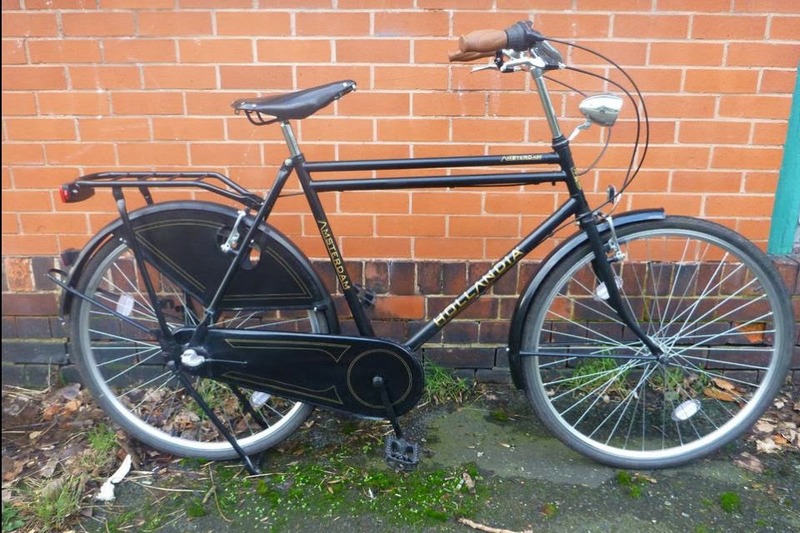 I was given a loop framed woman’s bike when I was ten years of age and when I passed my eleven plus my Dad’s sisters, who brought me up, bought me a brand new Raleigh Trent Tourist. When did you start making bikes and when did you finish? You worked out of Withington is that right? I first started building made to measure bike frames in 1980. I was an engineering draughtsman by trade but I was blacklisted by the Engineering Employer’s Federation. My wife was pregnant and I wasn’t prepared for a life on the dole, so I started building frames. I built my first one in an air-raid shelter in the backyard of our house at Levenshulme and then in a workshop in Stockport. In late 1981 I opened Medlock Cycles on Upper brook Street. That went bust as a result of the mass unemployment resulting from the closure of Manchester’s manufacturing industries in the early Thatcher years. Then I shared a workshop in Ancoats with a stove enameller and later opened Campus Cycles in Fallowfield (1997) and took over Withington Cycles in 2003. I stopped building frames shortly after. Do you get out and ride much these days? I did until about three years ago. I’m hoping to get fit again for my 70th birthday in July this year. What attracted you to building bikes? Can you remember your first build? Necessity is the mother of invention they say and I had to re-invent myself as a result of my being prevented from working at the job I was trained to do and loved to do. My first build was for myself, but then a friend insisted I sold it to him. You must have seen bike design change dramatically over the years (materials etc) what do you think of today's bikes? Basic design hasn’t changed in its essentials, ie the rider’s position in relation to the bike frame, because the best ergonomic position had been realised before the latest materials were developed. Materials have changed dramatically, particularly in the use of carbon fibre. I must admit I have never rode a carbon fibre frame for any length, but in most cases they certainly look beautiful. Titanium and aluminium frames leave a lot to be desired in my opinion. Generally speaking I see a lot of bikes to be admired. Are today's bikes a bit souless or is that sentimental nonsense? I don’t think they are. The essential difference between a bike and other modes of transport is that rider and bike become one, and the thing that determines whether the bike has “soul” is the individual rider’s relationship with his or her bike. So, as a rough estimate, how many bikes have you welded together? Any particular bikes stand out to you as memorable for whatever reason? I haven’t welded any together. They were all brazed or silversoldered. I don’t know how many I built, although I made many friends as a result. The most memorable bike is the tandem I brought my son up on. I ended up as a single parent when Tom was 22 months of age. He rode around in a child seat at first but he went on the back of a tandem I built to celebrate his fourth birthday and we had many adventures together on it, and cycled thousands of miles. 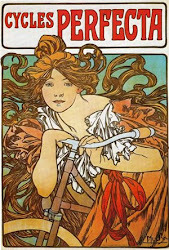 Cycling has a long-established link to socialism most notably through the clarion movement. Any thoughts on the relationship of cycling and the left? And, has cycling lost some of that link during its latest flowering of popularity? I think it’s brilliant that cycling is becoming more main stream in Britain. It’s long overdue and we still have a long way to go before we catch up with other countries. As for cycling’s connection with socialism I think what it needs is for socialists to start cycling again! Aficionados often cite Italian bikes as the most beautiful. Any thoughts on this? I was always impressed with Italian bikes, but I think British frame builders could and can hold their own with anybody. How many bikes do you now own? The greatest cyclist of all time is? What would your cycling utopia look like? A world where production was for human need, not human greed, and people finally realised they worked to live, rather than lived for work. In such a situation people would have plenty of time for leisure, to cycle and to walk, and not be reliant on enclosed boxes on wheels to get them from A to B as fast as possible. I've not yet read your biography but I will, is there any cycling related anecdote you have a bursting urge to share? Yes – but I’m going to have to think about it. Do you know of any epic journeys the bikes you made went on? One guy set out for Australia overland with two others. Unfortunately all disappeared into a deep hole when cycling through an unlit tunnel in Yugoslavia and all three wrecked their frames. Tom and myself cycled from Manchester to London, camping on the way when he was four, and to the Isle of Skye and back when he was six. We cycled round Ireland when he was ten and from Cherbourg to Bilbao over the Pyrenees when he was 13. One piece of cycling related advice you inherited and one you'd like to pass on. Always carry a roll of insulation tape with you as well as a spare inner tube. If you have a puncture because of a split in your tyre, you replace the inner tube, inflate it to the point where it rounds out, wrap the insulation tape around that part of the inner tube where the split in the tyre is. Then, when you inflate it to full pressure the tube can’t come through the split and burst. I've taken an unenforced break from the blog lately owing to the fact that it was in danger of becoming a blog about precipitation rather than cycling. Anyway, as you know, the correct number of bicycles to own is n+1 where n is the current number owned. Following this ethos of the Velominati's rule 12, allow me to introduce my new beautiful Dutch model. Infrastructure works to make Oxford Road, Portland Street and Piccadilly Gardens more bus, and bike, friendly are due to start this month according to TfGM. Coupled with the work to put new tram lines along Cross Street, it looks like it'll be a busy, and tricky few months of riding around Manchester City Centre. You can read the press release here if you're so inclined or you can watch the video thingamabob below. Whether this is the change to cycling infrastructure Manchester needs, I suppose only time will tell but what is for sure is that it's the best the city is going to get for years to come. Does it have the feel of something truly significant for cycling? Well, not really, its some segregated lanes and some coloured tarmac. Some lanes are routed behind bus stops, others not. And, of course, you have got to get to these facilities first of all. But, it's something and as a glass-half-full person, it is better than nowt. 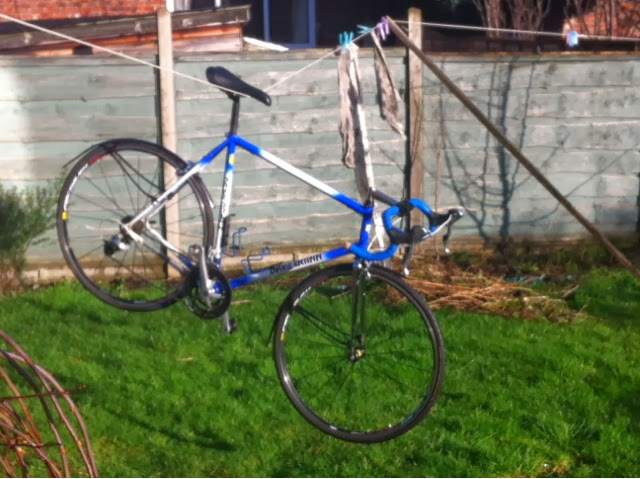 What's the best way to dry your bike post-wash? Hang it on the washing line? This week was probably the worst possible week to destroy your mudguards on your bike. The incessant rain and huge puddles of standing water have left my bike - which was gleaming on Monday morning - looking like its been cyclocrossing for ten days. I managed to completely destroy my Crud Roadracer mudguards by taking the outdoor cover off my bike - absurdly, the cover was stuck under the front one and as I pulled it up, a loud crack signaled the end of its useful life. That the rear one suffered a similar fate only moments later left me in a magnificent mood as I grappled around in the dark under sheets of rain. Anyway, five soaking rides later, my replacement Crud Roadracer guards arrived today and have been fitted post haste as it's still lashing down in Uppermill. These guards are the only choice for winter road bikes in my view - dead easy to fit, light and great coverage - what's not to like? 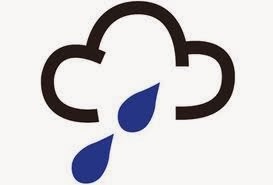 Hey ho, things should get better now - well when my shoes dry out from Monday they will.